Fedora 11 was released earlier this week so we have set out to see how its desktop performance compares to that of Ubuntu 9.04, which was released back in April. Using the Phoronix Test Suite we compared these two leading Linux distributions in tasks like code compilation, Apache web server performance, audio/video encoding, multi-processing, ray-tracing, computational biology, various disk tasks, graphics manipulation, encryption, chess AI, image conversion, database, and other tests. For this testing our system we used was an Intel Core 2 Duo E8400 clocked at 4.00GHz, ASUS P5E64 WS Professional motherboard, 2GB of DDR3 memory, a Western Digital 160GB WD1600JS-00M SATA hard drive, and a NVIDIA GeForce 9800GT graphics card. Ubuntu 9.04 ships with the Linux 2.6.28 kernel, GNOME 2.26.1, X Server 1.6.0, GCC 4.3.3, and an EXT3 file-system by default. Fedora 11 was using the Linux 2.6.29 kernel, GNOME 2.26.1, X Server 1.6.2 RC1, xf86-video-nouveau 0.0.10, GCC 4.4.0, and an EXT4 file-system by default. The x86_64 builds of both Fedora 11 and Ubuntu 9.04 were used. We were using the latest Phoronix Test Suite code for managing our testing process, which will go on to form the 2.0 Sandtorg release. Older versions of our testing software are available in the Fedora and Ubuntu repositories. The test profiles we used included timed PHP compilation, Apache benchmarking, LAME MP3 encoding, Ogg encoding, FFmpeg, GMPbench, Bwfirt, C-Ray, timed MAFFT alignment, Threaded I/O Tester, PostMark, Dbench, GraphicsMagick, OpenSSL, Crafty, Sunflow Rendering System, dcraw, Minion, SQLite, and PostgreSQL pgbench. When measuring how long it took to build out PHP 5.2.9 on each distribution, it was faster on Ubuntu by about four seconds. Ubuntu 9.04 is using the older GCC 4.3 branch while Fedora 11 is using the newest GCC 4.4 series. 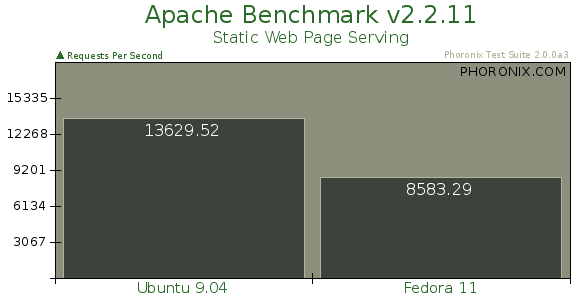 Ubuntu 9.04 had really smacked Fedora 11 when it came to the Apache Benchmark with the static web page serving performance. Ubuntu was able to sustain more than 58% more requests per second than Fedora 11. At encoding an MP3 file using LAME, the lead was in Fedora's favor but by just about 4%. When encoding an Ogg file it was more favorable on Ubuntu, but by a barely significant difference. 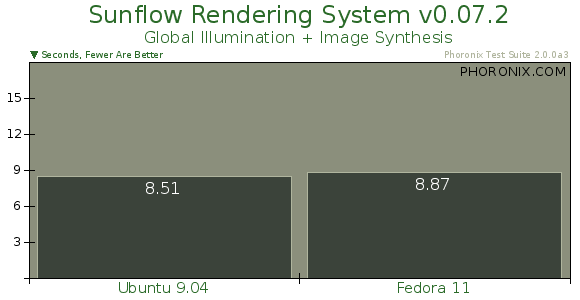 The time it took to encode an AVI to NTSC VCD using FFmpeg 0.5 was essentially dead even between the 64-bit versions of Ubuntu 9.04 and Fedora 11. The GMPbench performance was very close between Ubuntu and Fedora. With Bwfirt ray-tracing the performance was indifferent between Fedora and Ubuntu. With C-Ray, which is supposed to be a very simple ray-tracing engine, the lead was in Ubuntu's favor by about 12% -- 110 seconds versus 125 seconds for Ubuntu and Fedora, respectively. The timed MAFFT multiple sequence alignment was very close between Ubuntu 9.04 and Fedora 11. 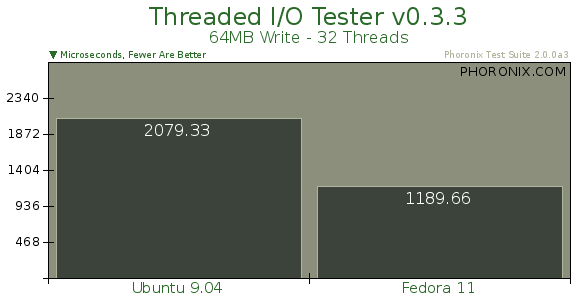 Fedora 11 did significantly better than Ubuntu 9.04 when it came to 64MB writes with 32 threads using the Threaded I/O Tester to benchmark the Serial ATA disk under Ubuntu and Fedora. Ubuntu 9.04 had a significantly higher latency. This large difference is likely due to performance improvements found in the Linux 2.6.29 kernel, which Fedora uses, as well as the EXT4 file-system. While the 64MB writes were faster under Fedora, the 64MB reads were better with Ubuntu. NetApp's PostMark had more transactions per second under Fedora 11 compared to Ubuntu 9.04 -- a 38% difference. 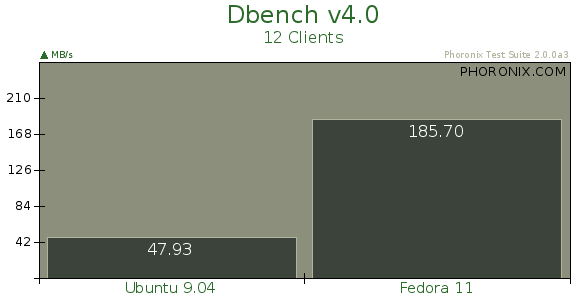 Fedora 11 continued to perform much better at the disk tests when it came to Dbench too with twelve clients. 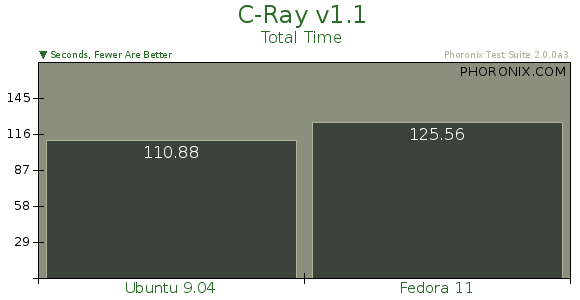 Fedora 11 was nearly four times faster than Ubuntu 9.04! Turning to the OpenMP-based GraphicsMagick for looking at the image manipulation performance, Ubuntu 9.04 was slightly faster. Fedora 11 had averaged 171 transactions per second while Ubuntu 9.04 was at 179 transactions per second, or about 5% faster, with the HWB color space conversion. With local adaptive thresholding in GraphicsMagick, the results were identical between the Canonical and Red Hat operating systems. The OpenSSL performance was also very close between Fedora and Ubuntu. Crafty, which is an open-source chess engine, performed about the same under the latest stable releases of Ubuntu and Fedora. The Java-based Sunflow Rendering System also had nearly identical results. More similar results... This time with dcraw as we measured how long it took to convert several files from RAW format to PPM files. The Minion constraint solver with the Solitaire benchmark also was close between Ubuntu 9.04 and Fedora 11. Fedora 11 did much better than Ubuntu 9.04 with the SQLite performance. This large difference is explained by a serious kernel regression we previously reported on several occasions in the past, but after being present in the kernel for several releases, it was finally fixed with the Linux 2.6.29 kernel. Ubuntu 9.04 with its Linux 2.6.28 kernel is still impacted by this SQLite regression, but should be fixed in Ubuntu 9.10 unless the regression reappears. Fedora 11 is also using EXT4 by default while Canonical is finally moving to this updated file-system with Ubuntu 9.10. 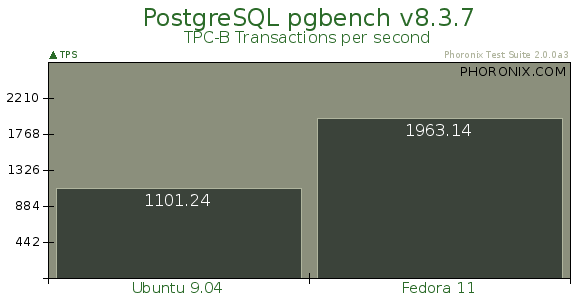 Fedora 11 not only did better with its SQLite database performance, but PostgreSQL ran much faster too under the operating system that's codenamed Leonidas. In a number of the benchmarks the results were close, but in a few areas there are some major performance differences. In particular, with the test profiles that stress the system disk, Fedora 11 generally did much better -- in part due to the EXT4 file-system and newer Linux kernel. Fedora also did much better with the database tests like SQLite and PostgreSQL. Ubuntu 9.04 though had done a better job with the Apache Benchmark and C-Ray. You can run your own benchmarks and compare these results using the Phoronix Test Suite.